By 1911, the American Indian population was wracked by disease, exploitation, discrimination, and extreme poverty. It was during this dark moment in history that American Indian individuals began to organize on a national scale and six highly educated women and men banded together to form the Society of American Indians (SAI). 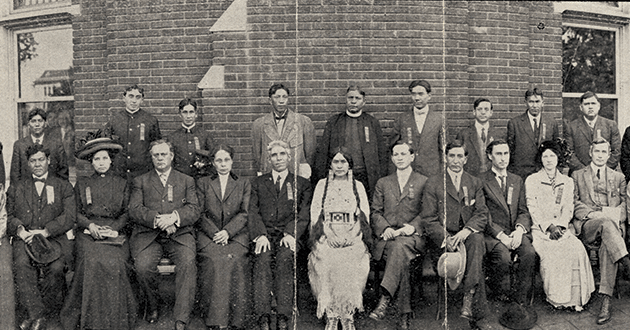 SAI was the first American Indian rights organization to be led and managed by American Indians themselves, and in 1911 they hosted their first national conference at Ohio State. “They established the SAI to organize their efforts, recruit allies, and to address the pressing issues of their day: health, education, civil rights, and local government,” said Marti Chaatsmith, associate director of Newark Earthworks Center. Ohio State Sociology Professor F.A. McKenzie assisted the early SAI leaders with organizing their efforts. After more than two years of correspondence, McKenzie invited them to hold a planning meeting on the Ohio State campus April 3-4, 1911. When Ohio State President William Oxley Thompson and Columbus Mayor George Sidney Marshall learned that the SAI was planning its first national conference, they extended a special invitation to host the event at Ohio State. This progressive and hospitable gesture would link both the city and the university to one of the key moments in American Indian history. Nearly 50 American Indian leaders, scholars, clergy, writers, artists, and other professionals participated in the 1911 symposium, as did representatives of the university, the Columbus mayor’s office, the Ohio governor’s office, and the National Office of Indian Affairs. Since American Indians were not citizens until 1924, the topic of citizenship was hotly debated, as were issues of education, law, traditional and contemporary arts, and economics. To mark the 100th anniversary of the SAI, Chad Allen, professor of English and coordinator for Ohio State’s American Indian Studies Program (AIS), oversaw the planning of the 2011 SAI symposium. Ohio State faculty, staff, and scholars from around the country attended the 2011 Society of American Indians Symposium held Columbus Day weekend. The celebration began with a formal welcome and brief remarks from the Chief of the Eastern Shawnee Tribe of Oklahoma, a representative of the Native American Indian Center of Central Ohio (NAICCO), Vice Provost of Diversity and Inclusion Valerie Lee, Executive Dean and Vice Provost Joseph Steinmetz, and University President E. Gordon Gee. Keynote addresses were delivered by today’s prominent American Indian scholars, Philip Deloria (University of Michigan), K. Tsianina Lomawaima (University of Arizona), and Robert Warrior (University of Illinois) with workshops to examine the current state of the field such as: Rhetoric and Reality of American Indian Citizenship; Boarding School Generations; and, Well-Known SAI Figures and Native American Languages: Past, Present, and Future Tense. The symposium also included a performance by American Indian performer, and recipient of the Lifetime Achievement Award from the Native Writers’ Circle of the Americas, Joy Harjo. Harjo is part of the President and Provost’s Diversity Lecture and Cultural Arts Series. Deloria has a familial connection to the SAI since his great-grandfather, also named Philip Joseph Deloria, was present at the 1911 conference. His great-grandfather was one of the first Dakota Sioux people to be ordained a minister in the Episcopal Church and during the symposium, preached to 1911 participants. Deloria has authored books on American Indian customs, culture, experiences, and history. He is currently a professor at the University of Michigan in both the Program in American Culture and the Department of History. “The experience gave me an emotional and psychological connection to the past. To know that just one century ago, my great-grandfather was occupying the same space was amazing,” he said. In keeping with the tradition of the first national meeting, the 2011 symposium included a trip to the Newark Earthworks. Built by the indigenous people of the Americas, the Newark Earthworks is 2,000 years old and served as a place of ceremony, astronomical observation, social gathering, trade, and worship. Several of the Newark Earthworks are owned by the Ohio Historical Society (OHS), well preserved, and open to the public, including the Great Circle. The Octagon Earthwork, although also owned by OHS, has been leased to the Moundbuilders Country Club since 1910. The club limits access to the site so that its members can play golf, allowing four days for public access each year. The Newark Earthworks are included on the UNESCO World Heritage Site’s Tentative List, a collection of sites that are in the nomination process to become a World Heritage Site. Once the nomination is accepted, the Newark Earthworks will be recognized as a place of outstanding universal value to humanity – like the Pyramids of Egypt, the Grand Canyon, and the Acropolis. “This experience isn’t just about replicating the 1911 meeting. Although native intellectual traditions are older than the Newark Earthworks, I want the trip to Newark and the 2011 symposium to help move American Indian Studies forward at Ohio State by linking the ancient intellectual history of the earthworks with the century-old political history of American Indians to the contemporary issues of the field today,” said Allen. Although the SAI lasted only until 1923, the SAI and the journal it published between 1913 and 1920, originally titled the Quarterly Journal of the American Indian (1913-1915) and later renamed the American Indian Magazine (1916-1920), are of great significance to the history of twentieth-century American Indian political, cultural, intellectual, and literary development. If you would like to become involved or support the American Indian Studies Program please contact Chad Allen with questions at (614) 292-6065, or Emily Alonso-Taub with questions regarding gifts at (614) 292-3487, or visit americanindianstudies.osu.edu.